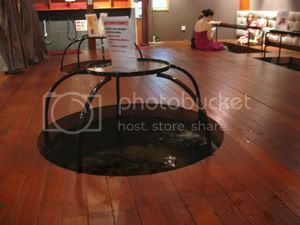 It was in 1 Utama, when we went passed a fish spa. Emily saw and she wants to go it to try. She saw this in Penang a couple of times but never walked in. Since there was a child package with 10% discount, I let her try it. Tim and I are ticklish so we didn’t join her but we accompany her. She is really daring, she put her feet in. 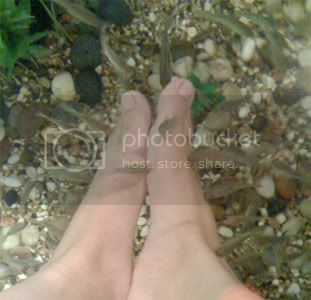 At first she felt ticklish but later her feet were surrounded by fish. She went from pond to pond. Some ponds have small fish and some had big fish. Today, I wanted to check out the price of fish spa in Queensbay. Children are FOC! Well, it attracted me and my hubby to try. I couldn’t stand the fish biting my palm of my foot, it made my hair stand. Later I got used to it. Funny, this time around only a few fish went to Emily’s feet. Maybe her feet were too clean. My hubby and I felt the feet a lot smoother. His dry skin under his feet felt softer. I don’t mind going again. If you hear of any good promo, let me know. ee…I will feel geli too…don’t think i will try this spa! i read somewhere that in singapore, some ppl kena allegy n rashes cos the water not clean… so must be extra careful. I won’t go for it as it’s so geli…hehe..
we went to the fish spa at one utama, they had promotion that time, i forgot what was it. something like buy 10 and get 2 free or something. after i was done with it, i don’t feel much different. my sole is very dry actually and it still felt the same after i was done. i went a few times but not anymore after the package was finished. I’ve nvr tried it but my girl has. 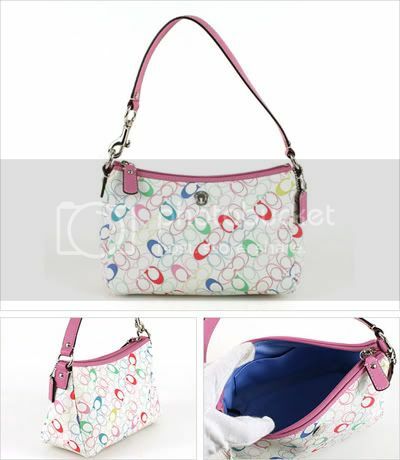 She likes it and whenever she sees it at shopping malls, she’ll ask for it. But we tell her once is enuff lah. Happy New Year to u n ur family, Mich! Just want to wish you a Happy New Year! I never tried that before.. although tempted to.